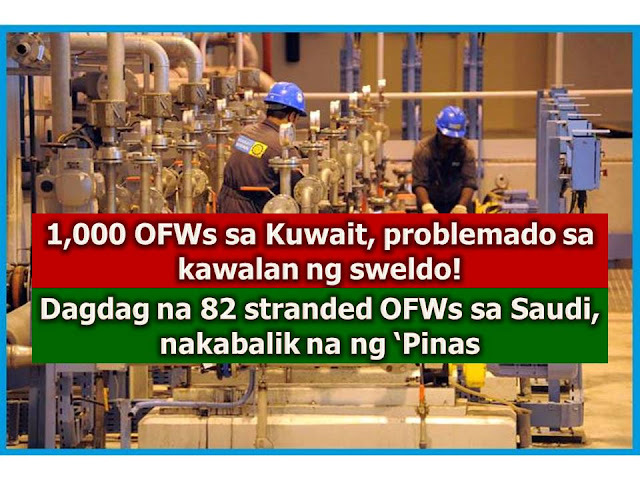 Around 1,000 overseas Filipino workers in Kuwait we not being paid their salaries by their employer for the past two to four months. With this the Department of Labor and Employment (DOLE) assured that it will extend all necessary help to 847 distressed OFW in Kuwait. DOLE Secretary Silvestre Bello III said they are willing to repatriate those OFWs in addition to more than 10,200 OFWs from Riyadh, Al Khobar and Jeddah in Saudi Arabia. Those OFWs from Saudi Arabia become jobless or retrenched due to the effect of the slump of oil prices in the Middile East early this year. Bello said that there are 847 OFW in Kuwait that did not received their salary from their employer, the Kharafi National KSC for the past two to four months. Of the said numbers, 773 are laborers and 74 are in supervisory, engineering, and administrative positions. Bello disclosed that representatives from the POLO and Kharafi National KSC already met last month to discuss the problem of delayed payments of salaries. Accordingly the Kharafi management agreed to settle their obligation to the affected OFW by the end of October. As of now, the said Kuwaiti company allowed their workers to resign and return to their country. They are also allowed to transfer to other companies if they are already employed to Kharafi for more than three years. Due to unpaid salaries, Philippine Overseas Employment Administration (POEA) has already ordered disqualification of Kharafi National KSC from the country's overseas employment program. There are more than 220,000 OFWs in Kuwait. Majority of them work as domestic helpers or about 60 percent. Eighty-two stranded overseas Filipino workers in Riyadh, Saudi Arabia has returned home on November 4. This, after their unfavorable experience working in the Middle East. They are included in thousands OFW who loses a job when oil prices slump. According to Victorino Izo, one of the 82 OFWs that they did not receive their salary for how many months but there are OFWs in Saudi who did not receive wages for more than a year. Because of the unfortunate situation, many of them are forced to work outside of their contract, such as gardening and selling their vegetable and other "sidelines" just to have little money to live. According to Philippine Overseas Employment Administration, there are 2,000 jobless OFWs that already returned home but there are more than 8,000 who need to be repatriated from Saudi Arabia.